The majority of our horses that are rescued and brought to Alaqua Animal Refuge come from abuse and/or neglect cruelty cases. These horrific situations that they come from end up hurting the horses both physically and mentally. Due to this, they spend a lot of time at the Refuge to heal and grow before they are able to reach an adoptable status. With Alaqua hosting up to as many as 23 horses on site at any given time the food expense alone can be as expensive as $5,000 a month. 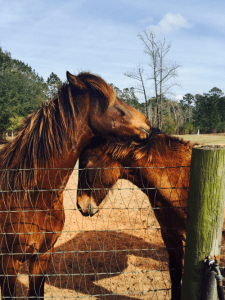 With a one time or monthly recurring donation of $250 you can help us rescue and rehabilitate many more horses from abusive environments. We could not do this important work without the support of our gracious donors and community. Thank you!